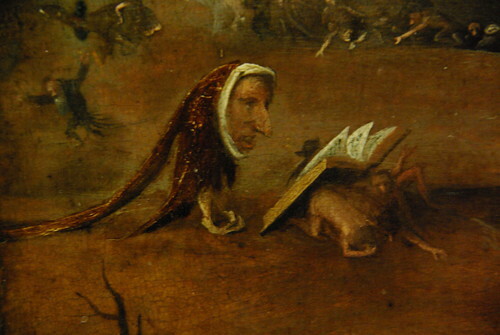 I was walking through the Met with another academic this weekend, and we encountered the above from the school of Bosch, c. 1550. In the full painting, Christ is barging down the gates of hell, and as soon as he crosses a ravine, he will encounter an intellectual. To get ahead this one has become merely a head. He even has a few disciples, subservient peons to serve as stands for his all important book. The image served as a fine warning to both of us. Of course, there will probably be many scholars in heaven as well... or so we hope.